Private 2 bedroom home with pond hidden in the woods. Welcome to the Cabin at Maple Pond. No matter the season you will find woods, water, and privacy from the outside world. Hidden on 19 acres of wooded property, we are minutes away from historic Zoar Village, Zoar Village Golf Course, Fort Laurens, The Ohio and Erie Canal Towpath Trail, and Amish Country. Only 25 minutes to Canton and the Pro Football Hall of Fame, less than an hour to Akron, and one and a half hours from the Cleveland area. Columbus and Pittsburgh are 2 hours away. You will be 20 minutes from Dover/New Philadelphia and Atwood Lake Park. We are easily accessed from I-77 (7 minute drive off the interstate).A pole barn fronting the property provides ample storage for any equipment, trailers, or campers. Follow a private 800 ft driveway through the woods to our hidden two bedroom, one bathroom cabin overlooking a 2 acre pond. Comfortably sleeps 6. Cabin has a large living room and an eat in kitchen. Clothes washer and dryer on premises. Sleep in comfort year round with our brand new electric AC and furnace. Enjoy a quiet evening by the water, walk any of the small trails, cook hot dogs and marshmallows, or visit nearby attractions. The cabin DOES NOT have internet or TV/cable, but receives excellent cell reception. 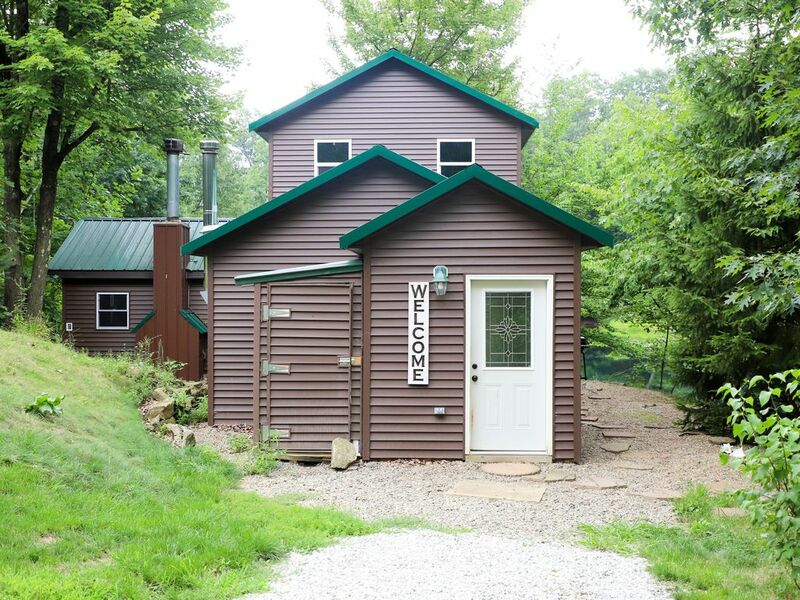 Our cabin is the place for kids to run around, catch frogs, tadpoles, and minnows. Watch the water bugs glide around the water. Kids thrive in the outdoors and this is the place to get wet, dirty, and play. At night the frogs create their own music loud enough to sing you to sleep. The property is fronted on the corner by a pole barn. Ask prior to your arrival if you would like to store any equipment in the barn during your stay. You will need to bring your own padlock for the door. It can accommodate vehicles, trailers or campers. The private drive way is located just past the pole barn. Look for our cabin mailbox! It weaves 800 feet through the woods to our cabin. The driveway has been newly reworked stone and is easily accessible in most weather conditions. If there is heavy snowfall we have the drive plowed to ensure access. Before reaching the cabin there is a small clearing on the left hand side of the drive. This area is a perfect spot for tents and camping. If you wish to stay with more than 6 people, please contact us and we can review your plan. There is a trampoline located at this site, however use at your own risk. A large gravel parking area and fire pit is set next to the cabin. There are also a number of trails that start from this location and wind through the property. Remember you are in the woods now so watch out for poison ivy! When you walk down the small hill you will see the cabin. The door on the left is a wood shed. The door on the right is for the mud room. The mud room has plenty of space to hang coats and store shoes. Go through the second door and you will enter the living room. It is newly remodeled and furnished. A large window overlooks Maple Pond. In the cabinet there are many games to play during your stay. The wood burning stove is NOT for use during rentals. We have a brand new heating/cooling system that will keep everyone comfortable. Walking through the living room you reach the kitchen. The kitchen is loaded with all new cooking supplies. There are pots, pans, cookie sheets, utensils, cutting boards, colander, bowls, casserole dishes, plates, cups, Crock Pot, coffee maker, food processor, water jug, and starter spices, oil, and coffee. Don’t want to do dishes during your stay? Good news. We have a dishwasher too. The cabin has well water. If you are not used to well water it may taste different. It is perfectly clean and safe to drink. The dining table has four chairs and a bench to seat 6 people. There is a large sliding glass door that provides a great view from the kitchen. The thermostat is located in the kitchen. Off the kitchen is the one bathroom. It is fully remodeled and brand new with a sink, toilet, and shower/tub. The shower head is magnetic so it easily detaches to make cleaning kids extra easy. Off the kitchen is the first floor bedroom. This room was the original cabin that was built on this location. It is wood paneled and has a (non-working) fireplace. The bed is a new queen mattress. In the closet are the washer and dryer with starter laundry soap and dryer sheets. The sliding glass doors open onto a covered deck. On the deck is the hammock, our favorite place to relax. The view from this location is the best on the property! We have spent lots of time just laying in the hammock listening to the birds and frogs. Upstairs there is a queen bed with a new mattress and a bunk bed with new mattresses. There is a large closet to hang or store clothes during your stay. Outside the cabin off the kitchen there is a new deck with a table and chairs to enjoy your meals. The deck is a great place to hang out and watch the water. Off the deck you will go down stone steps to a small dock. You can rest on the bench, watch the water bugs, or launch a kayak from this spot. The dock has a ladder for entering/exiting the water. The Maple Pond drops off quickly and gets quite deep. Swim at your own risk and always wear a life jacket. Circle around the back of the cabin and you go down stairs to a second dock. Tucked underneath the house is a porch swing where you can enjoy looking out over the lake. This area is the cove and has been cleared out and is our mini beach for digging and playing for our smaller guests. Under the house is a supply of pool noodles. There are currently 1 adult kayak, 1 canoe, and 1 kids sit-on-top kayak with a weight limit of 130 lbs. If you do use them, please treat them with care and return them to their location. Wear a life jacket while kayaking, even if you are a strong swimmer. Kayak and canoe at your own risk. Maple Pond is fully stocked and ready for you to fish. Bring your own poles and bait and get ready for the fish to jump onto your hook! Food Supply: After driving to the cabin and unloading your luggage, the last thing you want to do is head over to the grocery store. We got you covered. We can do a basic breakfast/lunch/snack stock for you. Do you want more specific items? Do you want a full meal supply? Flowers? Chocolates? Let us know how we can make your stay more comfortable. Plenty of room for your toys. Inquire about garage access. kayaks and canoe on site, life jackets too! only regret was that we could not have stayed longer to enjoy the cabin and surrounding area. Rose was very accommodating. I don't believe I could have found a better place to stay. Five stars!!!! Very nice place! Clean and super friendly host! Great house. Super Clean and updated, great pond and property. Rose was very easy to work with and a great host. Thanks for bringing your family to the Cabin at Maple Pond. I'm glad you had a great stay and I hope you can come again! Thanks for staying at the Cabin at Maple Pond. When you are back in town I hope you can stay again! The property is beautiful, surrounded by woods and water. The home is beautiful, too, well decorated with comfortable beds. We'll definitely be back! Thanks for staying with us and we look forward to having you back! Amazing cabin, view, and owners were great to work with! Rented the cabin for my wife’s birthday as a getaway. The cabin is beautiful with amazings views of the pond. Unfortunately there was a crazy wind storm and the area lost power, but Rose and her husband were very nice to bring us lanterns and candles on a Saturday night. A short drive to the main drag of Amish country, without being right in the middle of it. Would definitely recommend and we will definitely be back! Thank you to Rose and her husband for making things so nice and being great hosts! Heaven on Earth. Quiet. Peaceful. Retreat. If you love nature this home is perfect for an escape. The property provides a refuge of tranquility. Clean. Up to date. Well appointed kitchen. Great care has been taken to provide full enjoyment of the woods and pond. Comfy furniture and beds. Beautiful views. Off the beaten path but close to civilization, the highway and entertainment. Thanks for staying with us and we hope to have you back again soon!